- Interpret “more than” or “less than” problems without relying on cue words. 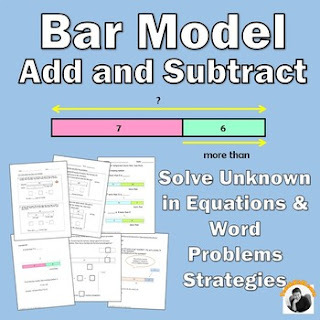 - Interpret and express word problems by drawing out into models, construct mathematical sentences and solve them. Include instructions and examples on adding-on operational structure and comparison model and respective exercises for practice. Apply strategies learned by solving 4 add and subtract word problems. Understanding operational structure of word problem, determine unknown using part/whole and comparison models concept are important strategies students should learn to solve word problems. It helps to build a solid foundation on story word problem solving skills so that students can solve complex story word problems as they progress. Based on Singapore method for learning mathematics. Go to My Purchases page (you may need to login). Beside each purchase you'll see a Provide Feedback Link. Simply click it and you will be taken to a page where you can give a quick rating and leave a short comment for the resource. Each time you give feedback, you receive feedback credits that you can use to lower the cost of your future purchases.